Aiisseee! (“I Say!”) is a television and radio-based game show designed to improve couple communication and promote couple connectedness by giving contestants and listeners the chance to discuss serious relationship issues in a humorous way. In these programs, couples answer questions to see how well they know their partners. The programs are a project of the Tanzania Capacity and Communication Project (TCCP). The show acts as a platform for conversations about HIV prevention, maternal and child health, and family planning, using a subtle yet provocative approach to create a comfortable forum for addressing hard-to-discuss issues in a non-confrontational way. Couple communication has been shown to positively influence health behaviors, including uptake of family planning, HIV counseling and testing and condom use. TCCP, therefore, sought to develop an integrated, interactive, entertainment-education platform that modeled effective couple communication, with the ultimate objective of improving health outcomes such as family planning, maternal and child health, and HIV prevention and treatment. Aiisseee! was designed to target couples of reproductive age. The program was designed to meaningfully engage both contestants and the wider audience, approach serious issues in a humorous way, and ‘push the envelope,’ without being aggressive or culturally insensitive. The program sought to model couple connectedness through mass media in order to increase reach, while simultaneously addressing the subject in an in-depth enough manner to create sustainable change. For the radio series, the creative agency (Khanga Rue Media), radio station (Clouds FM), and radio personalities (Adam Mchomvu and Gea Habib) were selected through competitive procurement and audition processes. The team developed a structure and question synopsis for the first 13 episodes. The name Aiisseee! (“I say!”), common Swahili slang, was selected for the program name, given its use to express shock or surprise. The program included a combined game show/documentary format. In the game show component, three couples competed in the studio to see who knew each other best, alternating between rounds where men were asked questions about the women, women were asked about the men, and partners were brought back into the studio after each round to see if their answers matched. In the final ‘hot seat’ round, each player answered the same question twice, once about oneself and once about his/her partner. The documentary component took place between studio competition rounds, as the program cut to an interviewer on the street. The interviewer asked passersby questions similar to those asked in the studio. Couples were recruited off the streets and through Facebook, screened for relationship authenticity, and auditioned to ensure they were comfortable on radio. The winning couple of each episode was awarded an all-expenses paid overnight get-away for two. Based on feedback from the radio game show's first season, the team expanded outside of Dar es Salaam and did regional recordings in two other regions, which included playing the game on stage, and recording outdoors where it drew more of a crowd. Five regional radio stations agreed to air it for free, again increasing the show's reach. 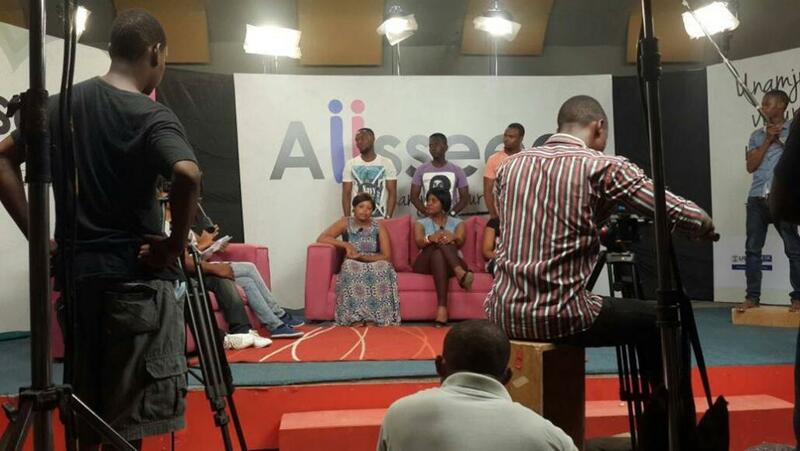 Early into Aiisseee!’s radio broadcast, the team was approached by multiple media houses, who, recognizing the show’s success and commercial viability, expressed interest in adapting Aiisseee! for television. TCCP issued a Request for Proposals to media houses to adapt Aiisseee! for television. TCCP, Khanga Rue Media, and Azam Media entered into a public-private partnership in which Azam Media agreed to provide free airtime, promotional spots, and PSAs. Azam was free to make the program a commercial broadcast. Sixteen TV episodes were produced through with the creative agency and Azam TV, which are posted on the Aiisseee! YouTube channel. The radio game show's first season launched in January 2014 and aired for 26 weeks on Sunday evenings in five-minute segments during the female co-host’s regularly scheduled program. Promotional spots which aired each week showed highlights from the previous episode, mentioned the previous week’s winners, and promoted the upcoming episode. As a program sponsor, TCCP placed two of the project’s PSAs from other campaigns in each episode. Aiisseee!’s Facebook and Twitter accounts were used to promote the program, pose questions to fans, provide links to full-length episodes and YouTube links to street interviews, post relationship-related content, and encourage fans to play the Aiisseee! Facebook app. Aiisseee! also shared its theme music as a ringtone. Aiisseee!’s artwork reflected the same playful nature of the program. Graphical elements were used for social media executions and in print and promotional materials, such as t-shirts, stickers, banners, tire covers, and pens. The second season of the radio program began in August 2014. Clouds FM aired a weekly repeat broadcast, increased the number of promotional spots aired per program, and agreed that episodes could be repackaged for broadcast on regional radio stations after initial broadcast. All 52 programs were re-packaged and distributed to regional radio stations to broadcast at no cost at a time of their convenience. Stations were free to make their own promotional spots, seek sponsorship, and retain any revenue generated from the program. The television program began airing on Azam TV in July 2015. TCCP conducted an internal qualitative post-test exercise at the end of Season 1 to seek operational input for the design of the next season. Two sets of focus group participants listened to a randomly selected episode and provided feedback on areas for improvement. TCCP, Khanga Rue Media, and Clouds FM also held regular review meetings throughout the season to make quick adjustments and determine how to increase reach and impact. Stakeholder review recommended further reinforcement of health messages by the co-hosts, repeat weekly broadcasts on Clouds FM, additional promotional spots, and a re-packaging of previously aired episodes for broadcast on regional radio stations in order to increase reach. The April 2014 survey found an estimated audience of almost one million (964,249) listeners age 18 or above. By August/September, listenership had more than doubled, with 8.9% of respondents reporting that they had listened to the program in the last 3 months. The January 2015 survey found that exposure to Aiisseee! was 6.4%, and it grew to 6.9% in May 2015. 12.3% of exposed participants reported doing something to improve their relationship as a result of listening to Aiisseee!, including talking more (41.2%), spending more time together (29.4%), going on dates (5.9%), and other (35.3%). The Aiisseee! Facebook fan-base had grown to 53,666 followers. The majority of the total fan base was male (76%), aged 18-24 and located in Dar es Salaam. The Facebook app had 3,524 lifetime total users. The Aiisseee! Facebook fan-base had grown to 113, 513 fans, 71% of whom are male, with the majority in the 18-34 age group. TCCP conducted a national, household-based, cross-sectional project midline survey in April 2014 with a nationally representative sample of 4,000 respondents (2,060 males and 1,940 females) aged 15-49 years, randomly selected from urban/peri-urban and rural areas to evaluate the program’s impact. Interview data was collected using tablets and interviewers were gender-matched to participants. Season two surveys suggested that use of a subtle yet provocative, humorous approach could create a comfortable forum for addressing hard-to-discuss issues in a non-confrontational way, ultimately leading to behavioral impact. Aiisseee! has now been aired free of charge on 5 regional radio stations, adapted for television, and is being broadcast at no cost to the project through a public-private partnership with a media house that recognized the program’s social significance and commercial viability. The Khanga Rue Media agency was chosen from the field of applicants. Selection of radio station, auditioning co-hosts, recording pilot programs, developeing structure/content synopsis, Also obtained approval from MoHSW Health Promotion and Education Section. RFP issued, media house selected, MoU signed, co-hosts auditioned, pre-production activities, pilot programs recorded. This took place from April 2014 to April 2015. By June 2014, the Aiiseee! Facebook fan-base had grown to 53,666 followers.